The Mariners took it to the road today to face the Arizona Diamonbacks but I don't think they knew what to expect in facing Wade Miley. I didn't know who Wade Miley was, but as it turns out, he's a pretty darn good pitcher. Not just against the Mariners, but all year. After today he carries an 8 and 3 record with a 2.30 ERA in 14 games. Not bad for a guy you've never heard of before today. The Mariners collected 9 hits over the course of the game, which isn't usually that bad of a number, but Miley only allowed one run on the day going 7 innings. Hector Noesi started for the Mariners and had the off side of his on again, off again starts. Noesi started off the first inning by lending a 3 spot to the D-backs and they seemed to play add on all day long. Aaron Hill hit for the cycle with a single, double and a triple off of Noesi and then a mammoth homerun off of reliever Shawn Kelley. 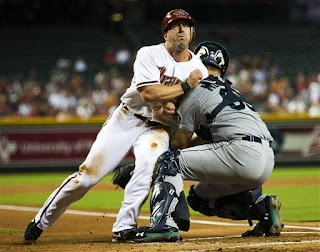 The good part of the day was running into old friends Willie Bloomquist and J.J. Putz. In fact, Willie got the opportunity to meet Jesus Montero face to face in the bottom of the first for the games first run. (Pictured Above) J.J. Putz closed the door for the D-backs. Virtually nothing happened for the Mariners apart from an RBI double by Casper Wells that scored Kyle Seager from 1st base in the top of the 6th. Wells tried to score from second on a Dustin Ackley single to left, but Jason Kubel gunned him out at home with a perfect one hopper to catcher Miguel Montero. Jesus Montero had some troubles behind the plate today. Casper Wells fed him a beautiful throw from right field that would have nailed Paul Goldschmidt at the plate but Montero didn't get the ball in his glove and missed the tag. Both plays at the plate Montero forgot to get the ball before attempting a tag. That's Jesus Montero, not Miguel Montero for AZ. So far the road journey isn't what I was hoping for, but like I said at the beginning, I didn't know we would be facing a guy like Wade Miley. Tomorrow we may have a better chance when we face Daniel Hudson who has a 5.67 ERA and a 3 and 1 record. The Mariners will send rookie Erasmo Ramirez to the hill for his second start of the season. Hopefully it turns better results than today's 7 to 1 loss.